One more swap item. 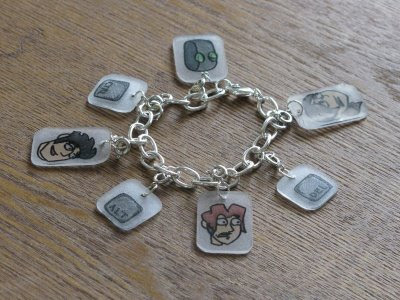 My swap partner is a fan of Ctrl Alt Del, so I made this charm bracelet with the characters out of Rough n Ready Shrinky Dinks. The charms have lobster claws on them, so they can come off and be used as stitch markers, or something. 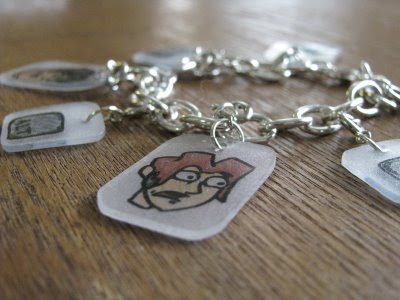 Shrinky dinks worked as expected, mostly. A few are a little warped, but not too bad. The backside remained rough and unfinished looking even after Mod Podge-ing, is there a fix for that? I have a solution for your warping. Sometimes shrinkydink plastic takes a little longer to flatten completely out so I cook mine until they are flat. It might take almost have a minute, but they won't be warped. Also, make sure you cook them on something flat. I have a question! How did you put holes in the charms? Did you do it before, or after? I'm making super-small shrinky dink items and would like holes in them for hanging later. Any tips? Thank you! Kelly - I made the hole before cooking, using a hole punch.